Phew – I finally completed this project! It took me over a year (I started it, took 8 mo off from the shop, then returned to complete it). It’s walnut with cherry bowties and pegs. 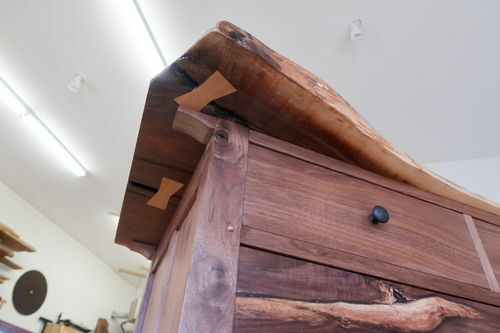 Maple back, drawer sides, and carcass parts. This thing is a beast! Very stout and heavy! 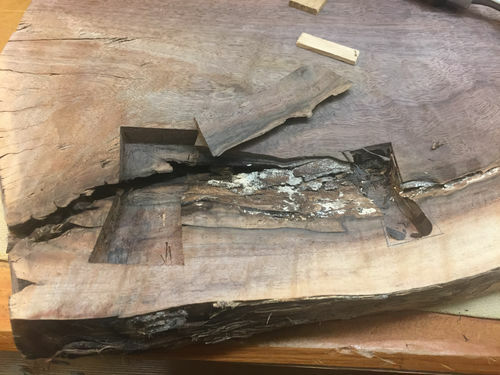 I learned a lot with this project: first time doing double mortise and tenons, first time working with a slab and live edge, first time doing bowties, first time doing a chest of drawers, and a few other firsts as well. I sprayed on 3 coats of Endurovar semi gloss – my new favorite finish. These plans came from Michael Pekovich at FWW. I changed things up and made my own Sketchup file first. 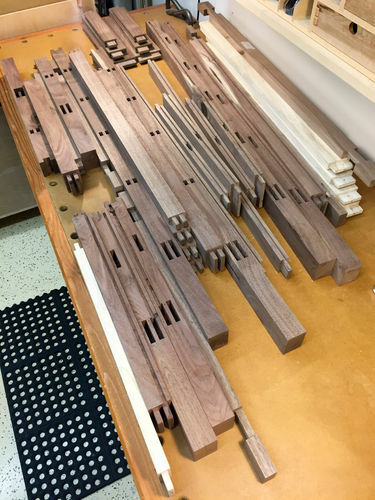 All the carcass parts ready for glue-up. Planing the tops level. I took almost an inch of thickness on the nightstand to get it level. That’s a lot of work! This piece popped out when chopping the bowties. Just for added protection, I added 3 bowties to the bottom as well. Bowties are 1/2” thick. Planing the drawers to fit. 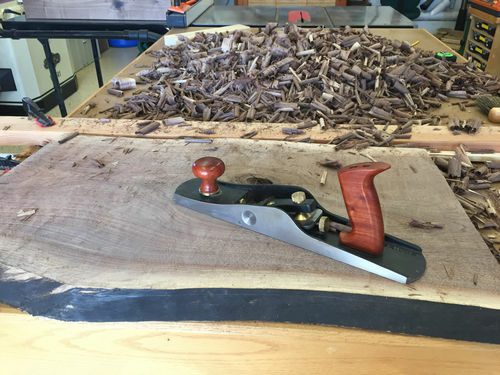 This is my favorite part of woodworking! 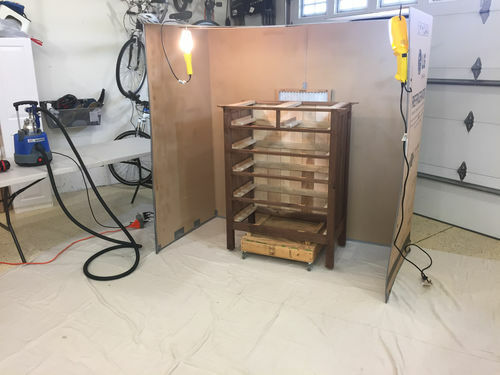 Love my refrigerator box spray booth! Great looking, very nice work. Looks like you have a very happy customer. 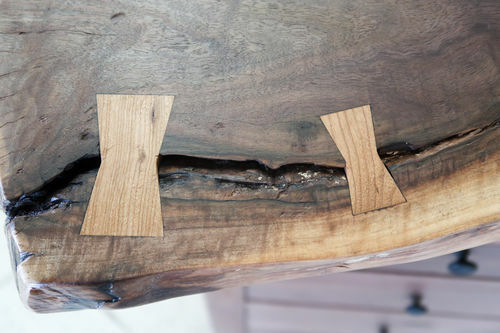 Great job of creating heirloom furniture. Michael can hand this down to his own child some day. -- Ron Wilson - maker of fine firewood! These pieces are very attractive. Nice work! well judging by the big smile on michaels face id say you made him very happy,and why wouldn’t he be with a beautiful set of furniture like that,excellent job travis. Seriously, great design and choice of wood, sure to be handed down for generations. Thanks for posting. Wow! This is really nice. I want to be like you when I get big! I like your brand – I had one made, but have now been forgetting to burn it into my projects when done, lol. 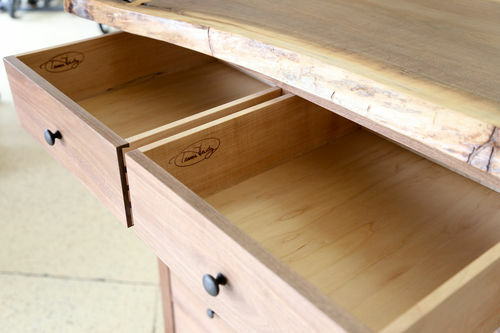 I also want to make drawers like this without slides. More precision required, and they are more traditional. Sounds backwards, I know. Great Job all around. How did you make those dove tails? I know – sometimes I forget to brand as well at the end of the project. Ug! It’s a big project. Good luck! 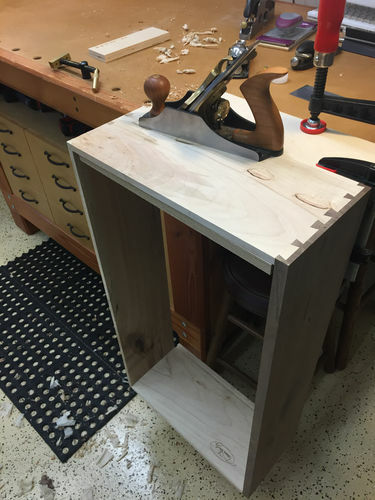 I used my Leigh jig for all the dovetails. Waaaay too many to cut by hand!